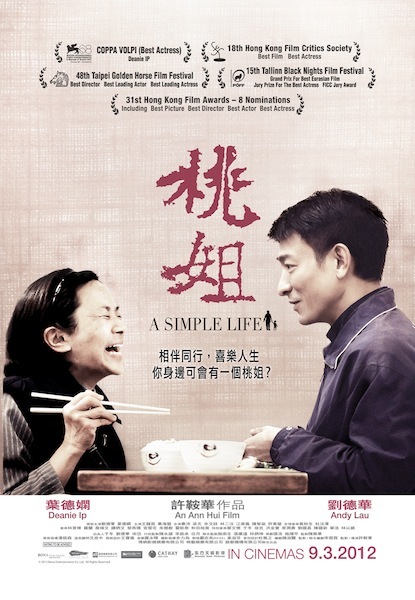 Inspired by the true story of film producer Roger Lee and his maid, Ann Hui's A Simple Life sees the director continue to hone her "slice of life" filmmaking skills, bringing her command of the realistic day to day mundanity to the kind of story many directors would have suffocated with histrionics and drowned with sentimentality. Without relying on any of the kind of huge movie moments so common to this type of drama, if you're anything like me, you'll be crying your heart out throughout. Ah Tao (Deanie Ip), maid to Roger (Andy Lau), has worked for his family for sixty years or more. When she has a debilitating stroke she requests to quit her job and move into a home. After a life of looking after another family, she finds that maybe she was more than just the maid when Roger begins to care for her. Using this simple framework to explore issues of ageing, loneliness, dignity and how we treat the elderly, A Simple Life throws plenty of food for thought at it's audience without ever becoming top heavy and losing sight of the story of Ah Tao and Roger. A storyline dealing with the kind of issues the film does may not sound like much fun and in places it is hard going, factor in a running time of almost two hours and it may sound like the odds are stacked against the film. However, the characters and the warmth and love between them make the film wonderful to sit through even during it's heavier moments. Roger Lee's participation in the film industry gives the perfect opportunity to pack the film with cameos from some of Hong Kong cinema's biggest names and while the humour this provides is a welcome addition it never clouds the central relationship of the film. As well as cameos from the likes of Tsui Hark and Sammo Hung playing themselves, the film also has small roles for Chapman To and best of all Anthony Wong, who has great fun with it. The supporting cast of well drawn characters add more weight and humour to the drama. Ultimately the film belongs to it's two stars and Andy Lau gives one of the most impressive performances of his career. In a role so subtle he barely does anything, the looks between him and Deanie Ip are instantly recognisable and say more than any amount of words ever could. 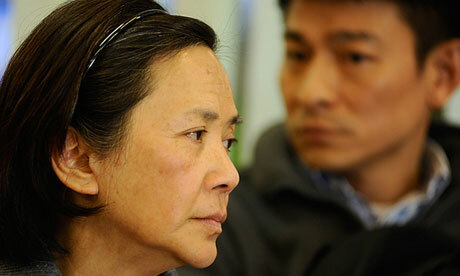 Deanie Ip is flat out incredible, as nuanced and emotional a performance as I can remember seeing in a Hong Kong film. The chemistry between the two stars is perfect, as it should be considering the amount of times they've played together over the years. A Simple Life delivers a compelling, richly emotional human story filled with warmth and humour. 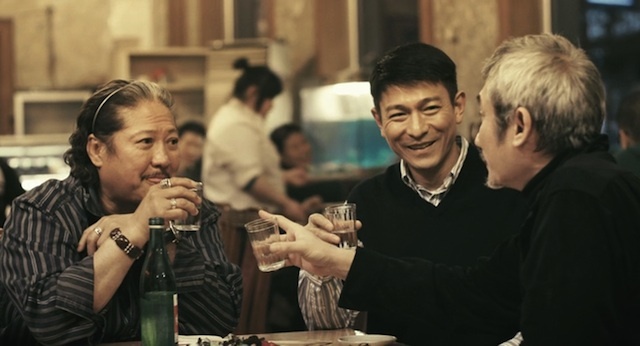 In lesser hands the film could have become a mawkishly sentimental mess or a tub thumping tirade about the treatment of elderly Hong Kongers, or even worse both. 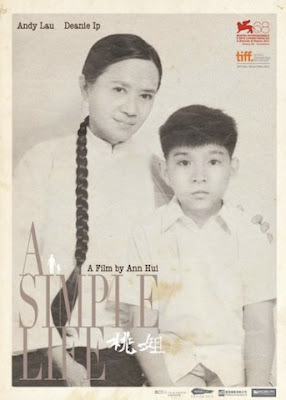 Instead thanks to Hui's sensitive direction and the loving focus on the central relationship beautifully played by Ip and Lau, A Simple Life is one of the best and most rewarding films I've seen for many a year and deserves all the praise and many awards lavished upon it. Great film. I've like all of Hui's films. Saw The Postmodern Life Of My Aunt at the HKIFF, and really liked it despite the jarring tone shift towards the end and I absolutely adored The Way We Are, not so familiar with her work previous to these, and yes I know I should be! I love this film and am glad you do too. I think Ann Hui truly has become great in the 21st century. I know there are fans of her 1980s works and worked with a lot of really good actresses in the 1990s but the two films from her that are my favorite by far are "The Way We Are" and, yes, "A Simple Life". It seems like a real tear jerker of a film. I was crying on the inside when I watched the trailer. Reminds me of the realities in getting older and how we should treat the elderly. I definitely have to catch up with "A Simple Life" and "The Way We Are". Also, very cool to see the cameo of Sammo & Tsui Hark.